Jewel of the Smokies WEEKLY & WINTER SPECIALS!!! This is absolutely the best that the Smokies and the premier RiverStone Resort & Spa have to offer. Everything you want if you want everything! Conveniently located in the heart of Pigeon Forge. 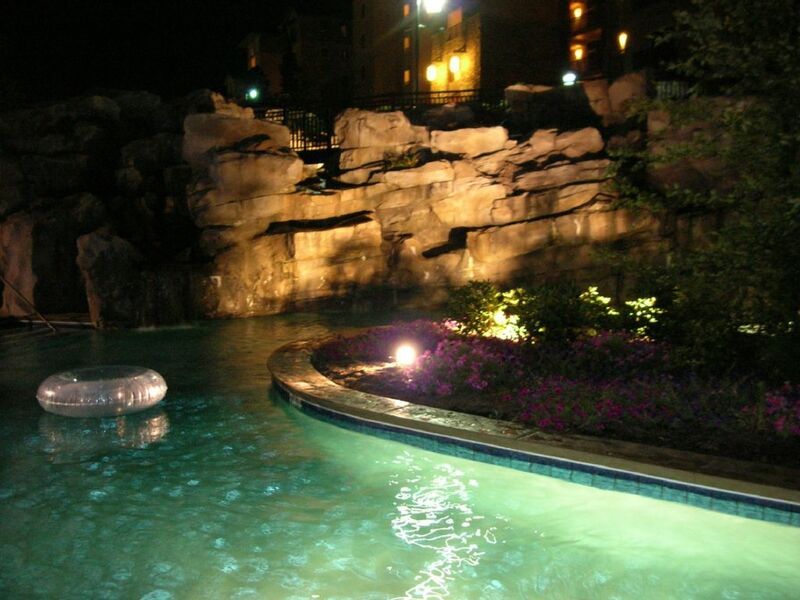 Our elegant condo is nestled in the best location between the Little Pigeon and Lazy River. Sip your morning coffee on our spacious balcony that faces Mt. LeConte. Listen to the cascading water and ducks quacking or watch the anglers fish. Dine as you overlook the tranquil lazy river that floats cares away. Take a secluded walk along the river pathway with frequent stops of solitude to generate your inner feelings. Our condominium will help you create wonderful, everlasting memories of pure bliss. You will feel comfortable and pampered in our modern, but tastefully decorated, fully furnished condominium. Your desire of luxury, quality, convenience, and value will be completely fulfilled. Joe - Please call 865-254-6100, if you need immediate assistance. Both Master and Guest Bath have been designed with natural stone cleft and decorated tile with feature strips in keeping a mountain theme throughout condo. Located next to Little Pigeon River. Joe was very easy to work with and very responsive. The condo was clean and there were many activities for the family on property. Enjoyed the large corner tub in the master bath. The condo was beautiful, fully equipped with the wonderful sound of running water from the river outside the balcony. The owner was very responsive and our stay was wonderfully relaxing and right next to the Smoky Mountains. I would stay here again! First time stay at Riverstone and hope to return. Wonderful resort!! Very relaxing, clean, and great location. Unit was just like the pictures showed. No disappointment. Joe was very quick to reply and helpful with reservation. Hope to return soon. We absolutely loved this condo and the owner!! We will be back to stay again very soon. It was perfect! Perfect place for a relaxing getaway weekend! Condo is very spacious and super clean! Definitely will be back! Thank you! This was my family's third stay at Riverstone Resort, and although all condos have been very nice, Condo #448 has been our favorite. It was very clean and did not lack any convenience; everything was available and in great working order. The condo sits right on the Pigeon River where a small number of Canada geese and a couple of ducks provided playful entertainment. Additionally, a beautiful man-made rock waterfall splashes into a lazy river just below windows that provided lots of natural light. Nearby and a short walk gets you to outdoor play areas for children and a beautiful indoor pool and equipped exercise room. Joe, the owner, was a pleasure to work with and he was very prompt in providing all information needed to make our stay a perfect experience. We hope to return as soon as possible! Our Gem, Jewel of the Smokies Condo, offers our guests unmatched privacy & views of RiverStone Resort with quiet, park-like setting in close proximity to shopping, dining, and many other local attractions. Our Condo is located in Building Four at RiverStone Resort in Pigeon Forge, TN. We are just off the parkway, secluded by the Little Pigeon River and the Gatlinburg 18 hole Golf Course and Country Club. Dollywood and Splash Country are 1.5 miles away (catch trolley) or the Great Smoky Mountains (most visited U.S. national park) is just minutes away. Dinner Theaters, speciality restaurants, outlet shopping, and even roll down a hill inside a clear ball (Zorb) is available. Pigeon Forge is the best location for all activities in East TN. Golf: The Gatlinburg Golf and Country Club, is directly adjacent to RiverStone Resort and Spa. Nearby is Eagle's Landing Golf Club and Bent Creek Golf Village. Winter Special not valid for holidays. Until confirmed, rates are subject to change without notice. Check-in time 4 P.M. Check-out 10 A.M. No parties allowed.